Hair Loss Is No Longer Inevitable. Now it’s Optional! With Male/Female Pattern Baldness/Hair Loss, patients start out with a full head of hair and gradually overtime, when you start shedding, the hair that grows back is weaker and thinner than the original. We refer to this has Miniaturization. It’s VITAL that when a patient notices this happening, they seek treatment! Unfortunately studies show that the patient does not seek help until they have lost 50% or more of the original hair. At 50% the Hair Loss is very noticeable. 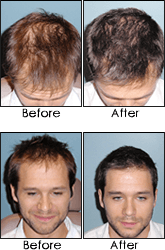 Advanced Cosmetic Surgery and Laser Center offers high tech hair transplant and replacement services. In addition, our Cincinnati Center offers SmartGraft Follicular Unit Extraction (FUE) and FUG (Strip)micro-follicular transplants and Laser Caps to generate hair regrowth. Call us today at 513-651-HAIR (4247) for more information about our select hair procedures.